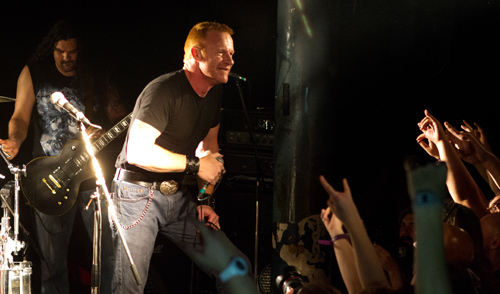 The wolf pack head out on their Wolfsnächte European tour, establishing their dominant position within the power metal genre. Tonight is their only UK date at the famous Underworld venue in London. German band Majesty kicked the night off. Manowar style metal can be a bit cheesy (ok very cheesy at times) and Majesty are no exception to that, but they put in a great set and got the crowd going, getting them to chant “hail hail to Majesty”, fists in the air and so on. Cheesy but still good fun to listen to, and a great start to the night. Impressively given the fact they were on stage at 5.30 – 90 minutes before most gigs open the doors, they still had a big crowd, which is very rare for an early start on a weeknight. Next up came Battle Beast. This was the band’s first trip to the UK, and my first time seeing them since the departure of their previous singer. By this time the venue was packed, and Battle Beast came out and proceeded to blow everyone away. With a set made up of songs from both their albums they were here to impress, and they did that with style. 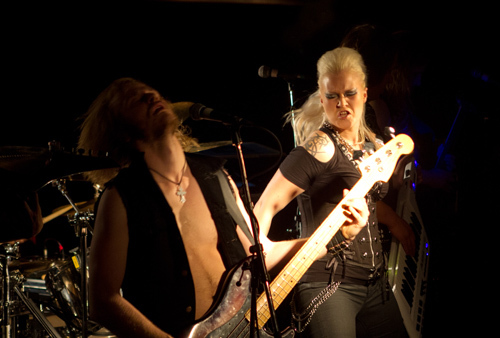 New singer Noora has the perfect voice for the band’s traditional heavy metal music, and like the rest of the band looks to be having a great time on stage. This was one hell of a good performance and the crowd loved it – they got a better reception than many headline bands I’ve seen at this venue, and the crowd was a sea of fists in the air for much of the set. This may have been their first trip to the UK but after the amazing reception they got tonight, I hope a promoter will get them over here again soon. The ex-members from Iced Earth and Nevermore bring forth a new band Ashes of Ares, who are the main support for tonight. They represent a band that is in need of a fine tune or two, with vocals that bearably reach the high notes and a drummer that plays within his own time, to create a collaboration of clutter and confusion. This could be due to the proximity of the stage set up as this can cause difficulty when hearing your fellow musicians, so not a comment that should be taken at face value. 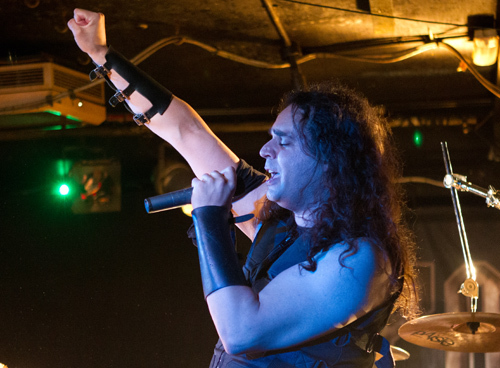 The set-list gave full exposure of their new debut album ‘Ashes To Ares’ however, being a newly formed band, a popular and suitable cover can draw in the audience to encapture their attention for their original material. That being said it is early days for them and the future will be bright if they learn to gel together. Tonight, the gathering of the pack rejoice as their hierarchies ‘alpha wolves’ enter with ‘Sanctified With Dynamite’. Many followers had traveled from afar to embrace the power of the wolves and by god did they celebrate their existence. ‘Amen And Attack’ was the first to be played from their new album ‘Preachers Of The Night’, the chorale was given below by the congregation of fans. Their dramatic presence was enticing to watch, Falk Maria Schlegel would hype up the audience with powerful symphonic keys whilst occasionally coming to the front of the stage to rouse the crowd in their power metal worship. And yes five songs in came the song we had all been waiting for ‘Resurrection By Erection’, there was an outcry as the well known intro came in followed by the opening riff. Mid set came a drum solo from Roel van Helden to say the least it was the only thing that was disappointing, it seemed to be lacking in showmanship and enthusiasm but technically it was good. Then raise your glass to Satan for ‘St Satan’s Day’. As the set comes to a close ‘We drink Your Blood’ and glorify the ‘Lupus Dei’. 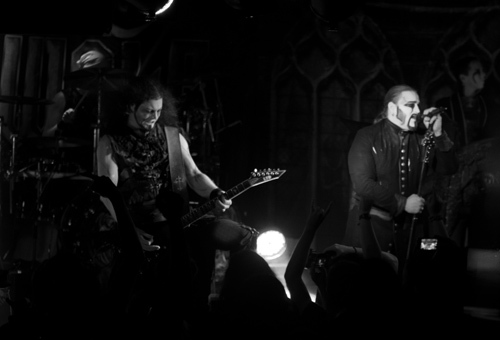 What makes Powerwolf so entertaining is the portrayed personas of territorial wolves, mixed with dark religious themes which is desirable to males, and the masculinity that is alluring to females. Don’t let the drawn on facial hair put you off, they give you blood, sweat and tears, making you thirsty for more. Majesty and Battle Beast review- words from Anthony May. POWERWOLF Unleash Brand New Video! On Tour This Fall!